Coupon campaigns have been used by brands since the launch of the first ever paper coupon by Coca Cola in 1887. The first coupons were distributed in the street, displayed within magazines, and placed inside post boxes. With the rapid development of technology including the invention of the internet, coupons have also changed over time, becoming predominantly distributed through online channels. Consumers enjoy being able to easily search for deals from their favorite brands and the ease of sharing them amongst friends and family. In 2013, RetailMeNot said, “Coupon usage is ubiquitous.” They revealed that 93% of Americans shop with coupons with 29% of Americans using mobile coupons. Consumer shopping habits have most certainly changed over the years, with many consumers becoming more price-conscious and opting to purchase one brand over another if they are offered some sort of a discount coupon. It is even reported that on average, consumers will spend 2 hours a week dedicated to hunting for deals online. 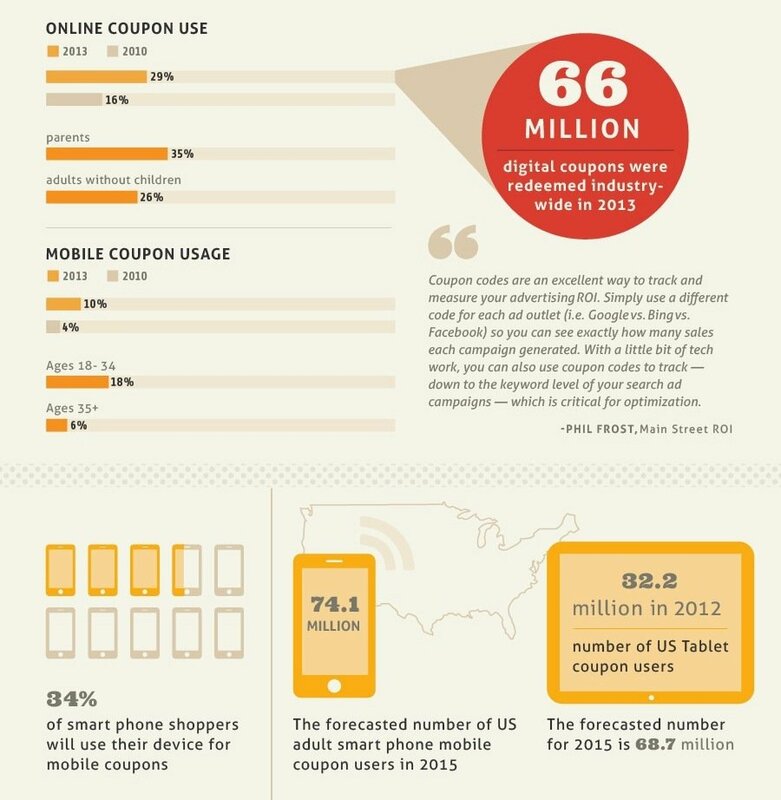 Of all coupons searched for, grocery coupons are the most popular, accounting for over 50% of coupon searches. 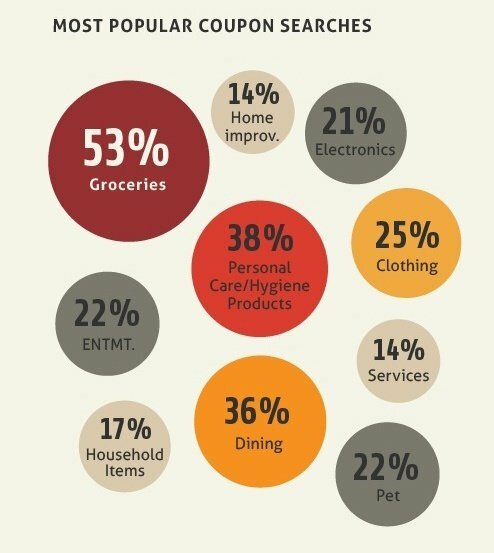 This is a clear indicator that more consumers are using coupons as a way to reduce their spend on essentials. Online shoppers have however said that the offer of a discount code on checkout may very well make them change their minds if they were undecided on a purchase – a great tip for retailers wanting to reduce the incidence of abandoned baskets. With checkout abandonment rates at an average rate of 64.7%, it is certainly a successful tactic many businesses now utilize to attract back the ever fickle online consumer. The most popular coupons are those which offer discounts on the products that consumers already like and would be purchasing in any event, and those which are substantial enough to make using them worthwhile. More and more brands are using coupons to build a loyal client base and this has so far proven effective. A staggering 91% of coupon redeemers have said they will purchase from a retailer again after they have been offered a coupon. A fair percentage (57%) of shoppers revealed that they would not have not have made a purchase had they not been offered that coupon in the first instance. So just how does a brand create a successful coupon campaign? Coupon promotion: Ensuring the offer is strategic and making sure the offer does not cannibalize your existing business. Gap’s super-successful coupon campaign gave them a turnover of over $US10 million in a single day. They ran a viral campaign by using a combination of email marketing and social media via multiple digital marketing channels all launched simultaneously; basically, everybody knew about it. 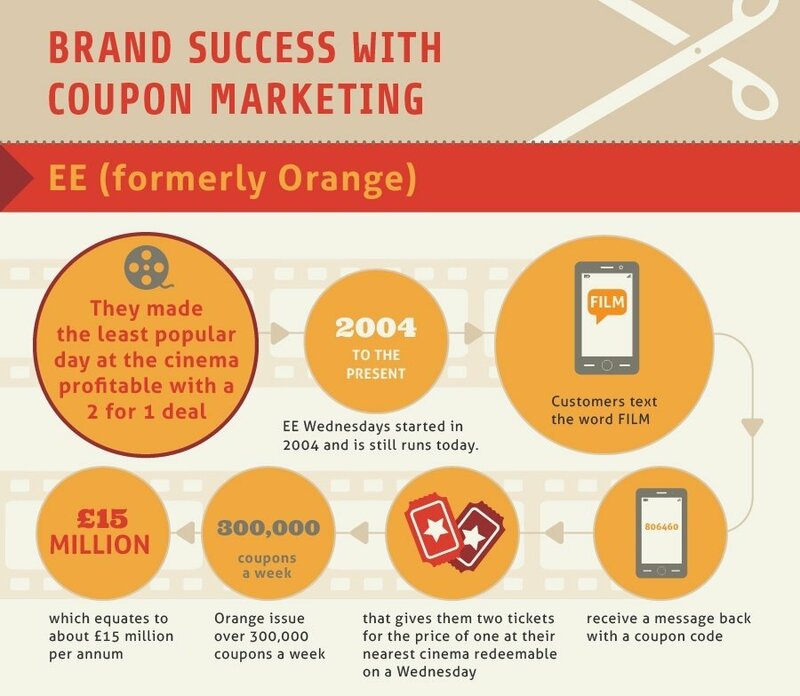 EE (formerly Orange) turned around the cinema industry and boosted customer loyalty with their then-named “Orange Wednesdays” by offering two cinema tickets for the price of one, redeemable on Wednesdays. Why Wednesday? Because it was one of the most quiet cinema days of the week. So not only have them built customer loyalty, but at the same time, did not cannibalize on busy cinema day profits by losing ticket-sales revenue. Social media and digital campaigns are by far the easiest to track the uptake, spread and profitability on, which sees them gaining popularity with businesses. More importantly, they are easier for consumers to share, so their spread is wider with less effort by the business. 40% of consumers will share an email offer with their friend and 28% of consumers will share deals via social media platforms – it is of course beneficial for brands to have built a sizable email mailing list and as well as a following through social media channels. What does this mean for a business? Essentially it translates to reduced and more focused marketing spend, making it more cost-effective than traditional methods and therefore gives retailers more bang for their buck. The offer of a coupon will entice consumers to ‘Like’ and share a Facebook page and build brand awareness rapidly in ways that old print media campaigns simply could not. It’s a no-brainer when ROI puts the business on the map and makes the finance department smile. Just make sure you have the experts to work with you on the right type of campaign delivered to your customer at the right time. While running an online business comes with the benefit of reduced business rates due to not requiring a brick and mortar shop front, the biggest challenge is to attract customers, reduce checkout abandonment rates, and fight off the fierce competition which is a mere click away. 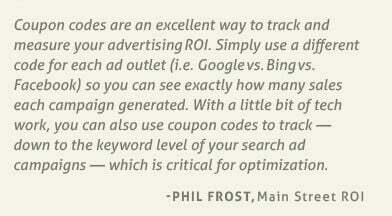 Many brands rely upon coupon campaigns as a method to do this. Coupon campaigns can be beneficial to brands small and large, packaged with good customer service, good quality products and a strong brand identity, they can really launch a business and help develop a regular customer base. Learn more about the research in the full infographic below and let us know if you’ve tried using your own digital coupons (and how they’ve worked for you). Emma Bostwick works for Vouchercloud.net. They help big brand distribute their latest voucher code campaigns.